Thank you very much to Grand Master Jack Rozinszky for judging our new Black belts and Cho Dan Bo’s last night. 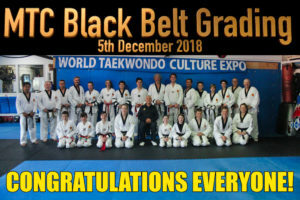 Also a big thank you to the instructors, black belts and parents who came in to help and support everyone. Grading results, including certificates, belts, stripes, special awards, will be handed out next week. We finish classes up on the 13th December (Thursday), and have the Movie Night on the 14th December.